Plutarch was an ancient historian who lived from 46-120 AD, and chronicled the lives of famous Greeks and Romans. 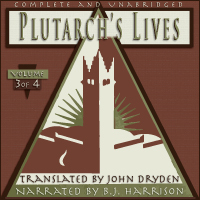 Plutarch’s Lives was the primary work that Shakespeare used when creating Coriolanus and Julius Caesar. It is also one of the two books that Mary Shelley mentions as comprising the curriculum for the education of Frankenstein’s Monster. The other was the Bible. Each volume in the 4 volume series of audiobooks is approximately 20 hours in length. Sertorius, Eumenes, Agesilaus, Pompey, Alexander, Caesar, Phocion, Cato the Younger, Agis, Cleomenes, and Tiberius Graccus. From JSD of Annandale, Virginia on 1/16/2016 . Murders, murderers, suicides - and much it really happened! I say "much of it" because a lot of it occurred many hundreds of years before Plutarch's time, so he was working from myth in some instances. I had been wanting to read this for decades but was daunted by the massiveness of the work. Mr. Harrison brought it to life. It really felt as if I I were listening to Plutarch himself. I listened to all four volumes -- probably 8 hours in all -- and was enthralled to to end. I am leaving this review . . .
From Anonymous of Grantsville, Utah on 6/12/2014 . 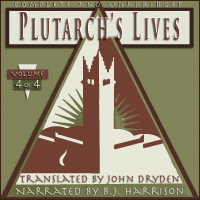 I have purchased and listened to Plutarch 1,2,3,and 4. 1 was hard to get into, but 2,3 4 were great. The historical value of this is to be treasured. I have difficulty seeing to read, and he has solved the situation. As usual, BJ read it exceptionally well and with his excellent great voice. 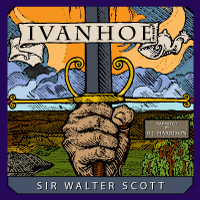 Volume 3 of 4 was an exceptional historical adventure, highly recommended.